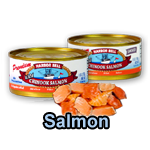 Our canned seafood is caught and processed in U.S.A. Choose us for great taste. In this department you'll find our famous tuna and other great seafood. The world's most flavorful tuna. You might just eat it right out of the can. Each can 6 oz. net wt. 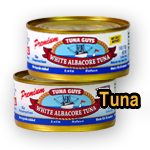 Depending on the canning cycle, some of our tuna may be packed with water added. 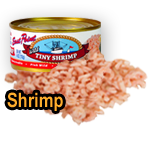 Our Tiny Shrimp comes from the cold waters of the Pacific Ocean. It has a light delicate flavor and is carefully hand-packed to lock in the great taste. We're convinced that, because it is locally harvested and locally processed, our shrimp beats the imports hands down. Our Salmon selections are the best the cold waters of the Willapa & Columbia Rivers have to offer. Try our regular or smoked Chinook, Sockeye & Coho. These great tasting salmon are loaded with flavor & heart healthy omega-3 fatty acids. Our salmon are wild caught, fancy packed, skinless with backbone removed. Try some today. Delicious Gourmet Dungeness Crab Meat. Rich and tender crab meat, caught and packed in the Pacific Northwest. Contact us about wholesale orders, corporate gift packs, custom orders and website questions. Privacy & Security Policy: We will not sell, rent, loan, trade or lease your personal information. All transactions are processed by PayPal on their secure servers. No credit card numbers are stored by us. Copyright 2008-2014 East Point Seafood Market and Dungeness Development Associates, Inc.